The American territories of Puerto Rico and the U.S. Virgin Islands weathered two devastating storms and are still struggling through the earliest stages of recovery. Category 5 Hurricane Irma hit the Caribbean on September 6, and two short weeks later, Hurricane Maria made a direct hit on Puerto Rico with sustained winds of 155 mph and belted the Virgin Islands with 185-mph winds. Yet more than a month after being hit hard by Hurricane Irma and three weeks after taking the brunt of Hurricane Maria, 36 percent of Puerto Ricans do not have access to clean water; nearly 90 percent of the island’s residents are without access to electricity; and those located inland remain cut off from supplies. The situation in the Virgin Islands is relatively unknown, although social media and local blogs are attempting to update residents on recovery efforts. Both of these American territories have been devastated by the recent storms and require rapid and comprehensive recovery assistance from the federal government. But given the limited information coming from the Virgin Islands, this column focuses primarily on relief efforts in Puerto Rico. Many of the recommendations explored in this report, however, could be applied to both territories. By the time Hurricane Maria passed, the 3.4 million U.S. citizens in Puerto Rico needed immediate aid. The governor declared that it could be six to eight months before power would be fully restored to the island. Already stretched-thin health facilities such as hospitals and dialysis centers needed diesel fuel to run generators. Many of the island’s poorest residents were unable to get to shelter and were left to wade through polluted floodwaters in search of safe ground. In addition, Puerto Rico’s power grid was instantly decimated, with Puerto Rico Gov. Ricardo Rosselló announcing 100 percent power loss before the storm had even run its course. Puerto Ricans outside of the island desperately sought contact with their loved ones, but cell towers and other communication channels were down. The first photos began to emerge, showing catastrophic flooding, homes left in ruin, roads impassable, and island residents in despair. And while the ports reopened on September 23, the logistical supply chain began to break down, making it all but impossible to get heavy equipment, fuel, food, and water to residents in need. The harrowing reality on the ground made it abundantly clear that the federal government had dropped the ball. Despite knowing the projected path and potential intensity of Hurricane Maria five days prior to it making landfall, the customary and proactive emergency response protocols did not occur. President Donald Trump issued a disaster declaration on September 20 but inexplicably held his first White House Situation Room briefing on Hurricane Maria six days after the storm, a delay a former Obama administration emergency relief official called “disaster malpractice.” Trump did not waive the Jones Act—a law that permits solely American ships to carry goods and passengers between American ports—until eight days after the storm, and he seemingly did so only in response to public outcry. It also took eight days for the U.S. Department of Defense to deploy a three-star general to the island to oversee relief efforts, which was likely the result of a delay in Federal Emergency Management Agency (FEMA) or White House approval, given that Secretary of Defense Jim Mattis said, “We had people ready to go as fast as they were asked for [by FEMA].” In addition, the Jones Act waiver, which expired October 11, has not been extended by the administration, making it increasingly difficult to import critical supplies. When Trump finally showed up on the island for a brief visit of just five hours—a full 13 days after Maria hit—he taunted, “We’ve spent a lot of money on Puerto Rico.” Days earlier he scolded the island’s residents, saying that they “want everything to be done for them.” In addition, Trump has threatened to cut off federal aid when residents need it most. Theories about the stalled federal response began to emerge, including accusations of racism and colonialism. It quickly became apparent that nearly half of Americans did not realize that Puerto Ricans were fellow U.S. citizens. Even states were slow to respond to Gov. Rosselló’s requests through the Emergency Management Assistance Compact, a mutual agreement in which states offer assistance to other states and territories during governor-declared disasters. Rumors pointed to fellow governors’ concerns about whether the island could repay states for the help. With the current death toll at 43, recovery and relief efforts continue, and so does the perceived lack of urgency and commitment from the Trump administration. The federal government can and should be doing more, not only in terms of near-term emergency response but in the form of a significant, up-front investment to ensure long-term, sustainable recovery for an island that was experiencing dire fiscal and infrastructure crises before Maria even hit. This responsibility not only falls on the president and his administration but on Congress as well. The federal government should undertake the following measures. Almost three weeks after the hurricane struck, Puerto Rico remains in critical condition and is unable to meet residents’ basic needs. Less than half of Puerto Rico has access to clean water, 95 percent of residents are still without access to electricity, and inland residents remain cutoff from supplies. The federal government has the responsibility to expedite the delivery of resources and provide adequate food, clean drinking water, shelter, power, health care, and communication channels to the residents of the U.S. territories. While there is no official count yet, Hurricane Maria has likely destroyed thousands of homes across Puerto Rico. There are 5,700 Puerto Ricans currently living in shelters, and many more are likely displaced from their homes. After the storm, NPR reported that there were 16,000 people who were temporarily homeless in just one small town near San Juan. Federal assistance has been slow to reach Puerto Rico. While Congress has appropriated funding for immediate aid, including housing assistance for Puerto Ricans whose homes were affected during the storm, only a very small fraction of Puerto Ricans are on a path to receive this aid anytime soon. Two weeks after the storm, the Federal Emergency Management Agency (FEMA) had only approved about 14,000 applications for assistance from distressed Puerto Ricans. And the first blue roof, a temporary roof installation that helps to prevent further damage to a home, was installed on October 5—15 days after the storm hit. For comparison, two weeks after Florida was hit by Hurricane Irma, FEMA had already approved about 145,000 applications from residents to receive help, and blue roofs were available across 17 Florida counties. Families displaced from their homes need access to safe temporary housing, and individuals with disabilities and their families need access to accessible units. Immediate funding is also needed to support emergency shelters and rental assistance and to make habitable units available to those who cannot yet return home. Displaced families also need to be made aware of and have easy ways to access FEMA assistance. In 1992, in the wake of Hurricane Andrew, few FEMA personnel sent to South Florida could speak Spanish, and none could speak Haitian Creole. This language barrier resulted in substantial delays in getting recovery assistance to many victims. According to Census Bureau data, approximately 80 percent of Puerto Rico’s residents speak English less than “very well.” In disaster relief efforts, access to information can mean the difference between life and death. The federal government must ensure that all vital information concerning food, water, shelter, medical care, safety, and transportation is provided in both English and Spanish. In addition, hard copy materials should be made available in accessible formats—braille and large print—and all speakers at televised press conferences should be accompanied by qualified sign language interpreters. FEMA has worked to overcome communication barriers in the past, but with personnel stretched thin and many agencies and other operators on the ground, the federal government cannot neglect this essential aspect of disaster assistance. The federal government should include Puerto Rico in Medicaid’s Disproportionate Share Hospital program, which requires state Medicaid programs to make payments to qualifying hospitals that serve large numbers of individuals who are uninsured or covered by Medicaid. In addition, the U.S. government should pay 100 percent of all care provided to Medicaid-eligible Puerto Rican residents for the next 12 months, including for those who have evacuated the island, to ensure that they receive the health care they need. This should include health care for individuals who had disabilities prior to the hurricane and those who have acquired disabilities as a result of the storm, as well as mental health care for traumatized individuals. Hurricane Maria knocked out Puerto Rico’s entire electric grid—with damage to 80 percent of the transmission and 100 percent of the distribution infrastructure. According to U.S. military officials, it could take four to six months to restore power to the entire island. The Department of Defense, in partnership with the Department of Energy and private companies, should airlift solar panels and battery packs to create ad hoc microgrids that can provide emergency electricity. Once basic relief needs are met, the federal government has the responsibility to ensure that residents are moving down a road of recovery in the upcoming weeks. 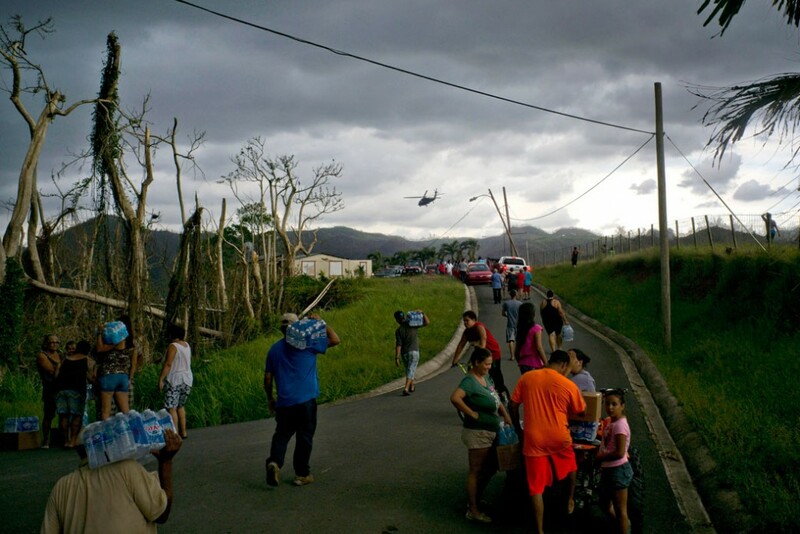 Funding for emergency shelters must be redirected to make sure families can return to their homes; the Puerto Rico Nutrition Assistance Program (PAN), Puerto Rico’s version of the Supplemental Nutrition Assistance Program (SNAP), and unemployment insurance benefits must be offered to newly displaced workers; environmental hazards must be contained and mitigated; and vulnerable populations must receive essential services to ensure that their health conditions are not exacerbated. Unlike SNAP, the Nutrition Assistance Program operates under a separate block grant. To date, the U.S. Department of Agriculture (USDA) has granted Puerto Rico’s request to allow PAN beneficiaries to use their benefits to purchase hot meals at retail outlets in October and November. The federal government should also permit Puerto Rico to implement Disaster SNAP, which would allow people who ordinarily might not be eligible for PAN to qualify if they have lost income or experienced property damage due to Hurricane Maria. In addition, Puerto Rico receives up to $71.5 million per year under the Temporary Assistance for Needy Families (TANF) block grant program. The amount of funding available to states and territories under the TANF block grant has not increased, even for inflation, since TANF was established two decades ago. States are eligible for contingency funding to meet additional need during unfavorable economic conditions, but Puerto Rico and other territories are not eligible for TANF contingency funding. Congress should increase Puerto Rico’s FY 2018 TANF block grant so that it can provide families with income security and other increased needs. Furthermore, Puerto Rico receives federal funding under the Low-Income Heating and Energy Assistance Program (LIHEAP) to provide cooling, crisis, and weatherization assistance. Congress should provide Puerto Rico with LIHEAP emergency contingency funding to meet additional utility and weatherization assistance needs due to Maria. There are 16 highly polluted industrial sites on the Superfund National Priorities List in Puerto Rico, as well as countless other toxic sites that are not part of the Superfund program. There has been no information about the state of these sites in the days before or after Maria hit the island. The Environmental Protection Agency (EPA) should move expeditiously to inspect and secure Puerto Rico’s Superfund sites and provide timely information to the public on their condition and any public health risks. Medicare in Puerto Rico also differs from Medicare in the 50 U.S. states and the District of Columbia. While enrollment in Medicare Part B—insurance for outpatient visits, physician services, and some home visits—is automatic for residents of U.S. states receiving Social Security, Puerto Ricans must opt in by contacting their local Social Security office. In addition, low-income Puerto Rican residents who are eligible for Medicare Part D are not eligible for the same premium and cost-sharing subsidies available to residents of the 50 U.S. states and the District of Columbia. Puerto Rican residents should be automatically enrolled in Part B going forward, and late enrollment penalties should be waived for those who are already Medicare eligible. Congress should also extend Part D premium and cost-sharing assistance to Puerto Rico residents. Hurricane Maria, along with Hurricane Irma directly before it, rendered about half of Puerto Rico’s hospitals inoperable, which makes it harder for people with disabilities, who comprise more than 20 percent of the island’s population, to access needed care. As long as the island remains difficult to navigate, it is arduous for people with physical disabilities in particular to move about and evacuate. Even if they are able to evacuate, shelters routinely turn away people with disabilities, do not allow emotional support animals inside, or lack sufficient trained personnel and medical supplies. It is important for states to have integration specialists in emergency preparedness agencies. Investments must be made up front as well, such as the creation of an inclusive disaster relief fund for Centers for Independent Living and other disability service providers. In addition, mental health services and crisis counseling should be integrated into recovery efforts—including increased funding for reasonable accommodations and supports across the education system—to account for an increasing number of people with disabilities returning to school. In response to the fifth strongest storm to ever hit the United States, recovery of Puerto Rico’s infrastructure and public services may take years to accomplish. Congress’s relief package, therefore, should not only be swift but also forward thinking, as it uses relief funding as an opportunity to build a stronger and more stable Puerto Rico. The island will require substantial federal funding to rebuild critical infrastructure and the island’s public schools. Furthermore, the detrimental state of the island’s health care system serves as an opportunity to reform health care networks and provide more equitable and accessible health care. Together, the relief package should encompass an economic stimulus to provide debt relief for the pensions and obligations of vulnerable residents. Over the coming weeks and months, the federal government must stabilize essential services such as electricity, drinking water, and sanitation to ensure public health and safety. However, stabilization work must also include rebuilding hospitals and community health centers. The federal government should include in its aid package sufficient funding to repair damaged facilities as well as expand access to community health centers. Beyond these initial steps, the federal government, working in partnership with local officials and community leaders, must rebuild major roadways, air fields, public housing, and irrigation—to name only a few areas—in order to allow commerce to begin to return to normal levels. Importantly, these investments must account for the increased risk of major storms and sea level rise. To the greatest extent possible, federal investments must be based on best practices for resilient infrastructure. The administration should also commit to the longer-term rebuilding that will be necessary in order for Puerto Ricans to return to their homes. The president’s recent request to Congress for $29 billion in supplemental aid for areas affected by Harvey, Irma, and Maria did not include a request for more Community Development Block Grant Disaster Recovery Program (CDBG-DR) funds. Much of the aid that local governments rely on to rebuild affordable housing comes through the CDBG-DR program. Leaving it out of additional aid packages could leave local governments in Puerto Rico, the U.S. Virgin Islands, Texas, and Florida in a bind. The administration must prioritize rebuilding affordable housing. All too often, precious affordable housing units are lost and not rebuilt after a natural disaster. New Orleans, for example, has lost more than half of its public housing units since Hurricane Katrina. There are nearly 107,000 public or federally subsidized housing units in Puerto Rico. The U.S. Department of Housing and Urban Development (HUD) should ensure that these units are rebuilt and that residents have the opportunity to return. HUD should also ensure a fair process for distributing funds to homeowners for rebuilding. After Hurricane Katrina, funds were allocated based on the value of a homeowner’s home instead of on the cost of repairs. This approach left many of those with the greatest financial need without the resources necessary to rebuild. Finally, homeowners affected by Hurricane Maria should be able to suspend their mortgage payments, free of charge, for at least one year while they pick up the pieces and begin to rebuild. A generous forbearance period, with fair repayment terms after the period ends, can help prevent foreclosures, which is good for homeowners, neighborhoods, and government mortgage insurers. In 2015, 52 percent of mortgages originated in Puerto Rico were insured by the Federal Housing Administration (FHA). If large numbers of homeowners default on their mortgages in Puerto Rico, the FHA insurance fund will be negatively affected. Puerto Rico faces an annual federal funding cap, per Section 1108 of the Social Security Act, that limits the amount that the federal government can spend on four critical programs, including TANF, Aid to the Aged, Blind, or Disabled (AABD), child welfare, and other social services. This flat-funded cap of $107,255,000 has not been raised or even adjusted for inflation since 1996. Increasing the flat-funded cap would drastically improve the adequacy of programs that help Puerto Ricans achieve economic security. In addition, Puerto Rico is currently ineligible for Supplemental Security Income (SSI)—a program that provides cash assistance to low-income individuals who are elderly, blind, or disabled. Rather, Puerto Ricans receive a meager benefit from AABD, which provides benefits about one-tenth as generous as SSI. Extending SSI to Puerto Ricans would increase their benefits significantly and reach three times the number of individuals in need. Furthermore, one of the most powerful anti-poverty tools in the United States is the Child Tax Credit (CTC), yet the credit is available only to Puerto Rican families with at least four children. It is critical to extend the CTC to all Puerto Rican families with children, per the Obama administration’s recommendation, and, at the same time, make improvements to the credit nationwide. The U.S. Department of Education should immediately make available resources through Project School Emergency Response to Violence (SERV) grants to both Puerto Rico and the U.S. Virgin Islands and streamline the application process to ensure funds are allocated as quickly as possible. Project SERV is intended to help school districts recover from traumatic events that disrupt the learning environment, and the devastation of Hurricane Maria has dramatically disrupted schooling in both territories. Given the level of need, the Department of Education should waive existing requirements to allow for Immediate Services grants of more than $50,000 and Extended Services grants of more than $250,000. Child care and Head Start facilities provide critical services to families and young children, especially during times of crisis. Congress should provide resources to support early childhood program providers in safe, clean facilities in either home-based or center-based programs to address children’s nutritional needs, physical health, and mental health as they experience stress related to the disaster and recovery. FEMA should ensure that there are enough infant and toddler kits available for distribution to Puerto Rico’s more than 160,000 children between the ages of 0 to 4, which include supplies such as diapers, food and formula, and bathing supplies. The federal government’s funding contribution to Medicaid in Puerto Rico is much more limited than it is in the 50 U.S. states and the District of Columbia. In addition to these financing limitations, Puerto Rico’s residents are disproportionately low-income, so it has a greater Medicaid-eligible population than more than half of states. Congress should permanently remove the caps on federal Medicaid spending as well as the arbitrarily low federal matching percentage for the territory. Instead, the federal matching percentage for Puerto Rico should be calculated using the same criteria as the 50 states and the District of Columbia. Congress should also allow Puerto Rico to expand Medicaid under the Affordable Care Act. The devastation of Puerto Rico by Hurricane Maria has drastically altered the long-run economic prospects of the island. The damage done to essential infrastructure and private property is likely to require tens of billions of dollars in expenditure before the economy can function normally. The government of Puerto Rico, with revenues decimated and burdened by $70 billion in debt, will be unable to fund the needed public expenditure on its own. The existing federal tools for helping the Puerto Rican economy—embedded in the oversight board and debt resolution process created by the Puerto Rico Oversight, Management, and Economic Stability Act (PROMESA)—need to be reset in order to accommodate the new reality facing Puerto Rico. The debt burden needs to be reduced significantly if the Puerto Rican government is to reduce its payment obligations and borrow needed funds for rebuilding. If this cannot be achieved through the PROMESA mechanism, proposals such as Sen. Bernie Sanders’ (I-VT) legislation that would establish more powerful debt-reduction mechanisms or even the possibility of entirely eliminating Puerto Rico’s debt, as suggested by former Treasury Secretary Larry Summers, should be carefully considered. As the Trump administration and Congress consider options to rebuild Puerto Rico and the U.S. Virgin Islands, they should go beyond just matching aid provided for states after Hurricanes Harvey and Irma and take the opportunity to address a century of neglect to these territories. In addition to immediate emergency response, debt relief, and stepping up social safety net aid to help distressed residents, relief packages should include options for lasting, sustainable infrastructure and support for our fellow Americans. Erin Cohan is the director of State and Local Government Affairs at the Center for American Progress. Sarah Shapiro is a special assistant for the Executive team at the Center. Rebecca Cokley is a senior fellow for Disability Policy at the Center. Sarah Edelman is the director of Housing Policy at the Center. Gregg Gelzinis is a special assistant for Economic Policy at the Center. Connor Maxwell is a research associate for Progress 2050 at the Center. Scott Sargrad is the managing director for K-12 Education Policy at the Center. Eliza Schultz is a research assistant for the Poverty to Prosperity Program at the Center.